There are some things I think all competent human adults ought to be able to do. Cook a meal, read out loud without making the audience cringe, frighten children, you know, the important basics. Sewing is on the list, and given my magical abilities to make sewing machine seize up just by walking into the room, I will forever hold myself in just a bit of contempt. Basic furniture construction is also on the list, perhaps because I read too many of the Little House books as a kid. I’d never tried furniture construction, so I was never quite sure just how much contempt I ought to feel for myself. This is where my frustration with my sagging, plastic bookshelves comes in. When we first moved to Madison I was flat broke, but had something like twenty boxes of books I needed to put somewhere. So I went out and found the cheapest functional bookshelves I could, bought three of them, and shoved the rest of the books under my bed. 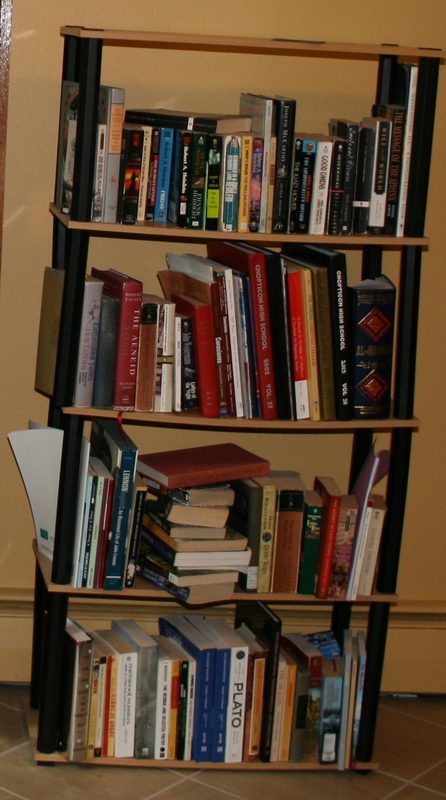 When we got the house, I laid claim to the bedroom with the built-in bookshelves, and for a little while, had enough space to store them. You know what plastic bookshelves can’t do? Hold up all four volumes of Absolute Sandman for four years. Or your nine pound Arabic/English dictionary. Or a similarly weighty Oxford English Dictionary. Or your complete works of Charlotte Bronte, William Shakespeare and EM Forster on the same shelf. But these were all books I wanted in public spaces where they’d be accessible and show people how smart I am, not tucked away in my bedroom. The bedroom is for books I want to grab when I have insomnia. Last winter I hit upon the perfect solution. I would test my competency and get fabulous furniture by building the bookshelves myself. I was working in Cleveland and bored out of my gourd; I was full of all kinds of great ideas for things to do. And I must say, all of my friends and relatives were extremely supportive of this endeavor. Then there’s the comment from a friend who shall remain anonymous: “Staples and duct tape will not hold up your shelves.” This, again, might sound like she was casting doubt on my abilities, as if my technique for circumventing my crippling inability to sew might become an attractive alternative to actual construction. In actuality, she was pointing out how the skills required for sewing, like following a straight line, have nothing in common with carpentry. And most endearingly, the comment from my sister. “Do you actually know how to do that?” Can’t you just hear the awe in her tone? The undercurrent of, “Wow, my big sister is clever and will in no way cut off her hand.” It’s touching. Truly. To prove to everybody that, lo, I can turn wood into sturdy (and attractive!) shelving, I took pictures of the whole process. And since I suspect I’m pushing the TL:DR threshold, I’ve broken the epic into parts. This is the introduction. And here, have a picture of what I’m replacing.